In October Piedmont Gardens opened its doors to residents from Spring Lake Village after the Santa Rosa-based senior living community received notice to evacuate due to the devastating fires in Sonoma, Napa and surrounding counties. While some residents were moved to schools and other makeshift shelters, others with particular health requirements needed a place where they could continue to receive quality, uninterrupted care. Through industry contacts, Episcopal Senior Communities, the parent organization of Spring Lake Village, connected with representatives at HumanGood. Within hours, a plan was in place to safely transport more than a dozen skilled nursing and memory care residents to the Bay Area. We as a team activated our Emergency Operations Plan, and everyone stepped in to support and make the process as smooth as possible. 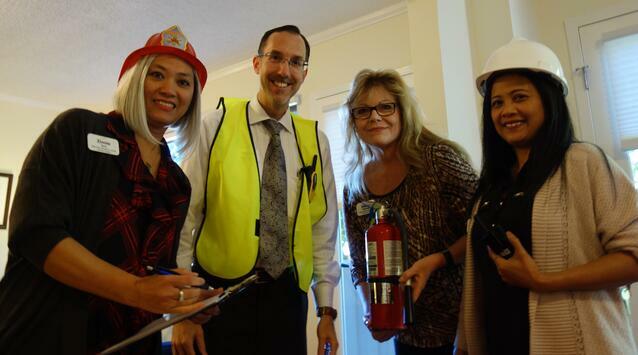 We set our leadership team into motion to prepare for the residents’ arrival; we were expecting 13 residents in total. As part of the plan we determined an incident commander would lead each shift. Since we were on the receiving end of the emergency, we kept the incident command structure simple but we were flexible and ready for any unexpected circumstances. The incident commander, which was handed off during each shift, wore a designated safety vest and maintained our binder that included all critical information including updates on the fires. The designated commander would be in charge of updating that binder during every shift as well as meeting with the leadership team to discuss those updates. To prepare the rooms, we already had furniture on site due to some remodeling happening at Piedmont Gardens; so our facilities team moved some furnishings into several rooms in the Grove, our memory care center, and the Village, our skilled nursing center. We did have to rent a few hospital beds for the residents who stayed at the Grove. The housekeeping team stocked up on linens for our guests. Our clinical team worked through all the health information needed for charts upon their arrival. Our dining team prepared meals since these residents were likely to be hungry upon arriving; and they also made meals for the EMTs who had been working at least 36 hours straight. By the evening of Oct. 10, we welcomed all of our guests with a warm meal and bath. Families of evacuees were notified that their loved ones were safe and sound at Piedmont Gardens. Our leadership team also stayed in close contact with the leadership team at Spring Lake Valley; and they sent their own director of nursing to visit with each resident. State and county officials also checked in on the residents to ensure they were in good health. By early November all of our guests returned to their community. As our executive director, Kevin Smith stated, the group came to Piedmont Gardens as strangers, but they departed as neighbors and friends.